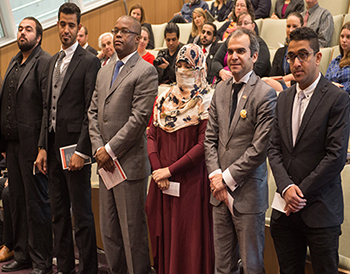 The College of Law recently held a commencement ceremony for its LL.M. in American Law students who are graduating this December. The LL.M. in American Law program is an advanced degree for foreign-trained legal professionals who want to broaden their understanding of American laws and the U.S.’s legal system. The ceremony featured a commencement address from George H. Lowe, retired U.S. Magistrate Judge for the Northern District of New York, and, of counsel, Bond, Schoeneck & King PLLC.